Squirrel Information: The Eastern Gray Squirrel is notorious for chewing into attics, and living there, particularly in the early autumn and spring. Fast Squirrel Removal - Call 407-956-1268 any time of the day, and we will discuss your squirrel problem & schedule a same-day or next-day appointment. I deal with squirrels on an almost daily basis, and have been working with this nuisance animal for 7 years. I do not perform squirrel extermination. 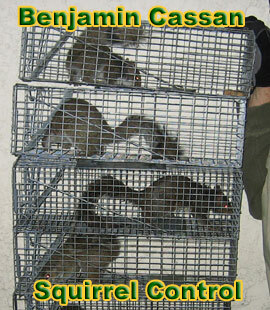 Rather, I am a humane squirrel trapper company, and I prefer to use live trapping and relocation, or exclusion. The best way to achieve effective squirrel control is to understand the animal and its behavior, and establish the appropriate course of action given the property and matter at hand. Squirrels are not bad animals, but they are common in urban areas, Orlando included of course, and I excel at solving squirrel problems quickly, professionally, and effectively. I aim for permanent results, to keep those squirrels away for good! Squirrels: Damage To Insulation Caused By These Critters? One of the main reasons that you want to get rid of squirrels that have made their way into your home is that they can actually damage your home and that will cost you a lot of money. Some of that damage is what can be done to your insulation. Squirrels damage to insulation can be large if the squirrels are left unchecked in your home. The damage to the insulation is done so that the squirrel can more easily come in and go out of your home as well as to find a hiding place in your walls. They also use it as nesting material. There are ways to recognize damage done by squirrels; the first way is to check if the squirrels damage to insulation looks as if it is done to nest. Squirrels do not have much trouble chewing through the insulation because they actually need to chew to keep their teeth from growing too much because their teeth never stop growing. The chewing to the insulation has the dual purpose of preventing their teeth from getting too big to eat and of course nesting and seeking shelter. If you spot that you have damage to your insulation, you’ll then want take the steps necessary to get rid of the squirrels before the damage is much greater. If you have any squirrel questions or comments, e-mail info@cassanwildlife.com or better yet, please call 407-956-1268 and I will answer.